Minister for Public Expenditure and Reform, Paschal Donohoe T.D. and Minister for Social Protection, Leo Varadkar T.D. today launched ‘MyGovID’ – a safe and secure way to access Irish government services online. ‘MyGovID’ gives citizens a secure “single sign on” to their public services. It is built on the Public Services Card, linking a ‘real word’ identity to an online identity. It can already be used to access Revenue’s ‘myAccount’ services and ‘MyWelfare.ie’ online services from the Department of Social Protection, including Maternity and Paternity Benefit applications. Other government services will follow in the months ahead, including Passport applications and driving licences. There are already 170,000 registered ‘MyGovID’ account holders and Ministers Donohoe and Varadkar are urging people to sign up. 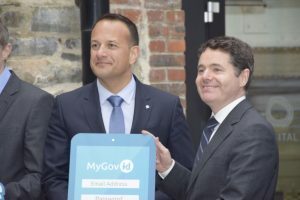 Commenting at the launch, Minister for Social Protection Leo Varadkar T.D., said: “With ‘MyGovID’ we are making life easier for all our citizens by giving them access to key services and benefits from their laptop, mobile phone or tablet. You can already apply for Maternity or Paternity Benefit using ‘MyGovID’ and the range of services is being expanded all the time. The plan is that eventually all Government services will be available online through ‘MyGovID’. I strongly encourage people to visit www.MyGovID.ie and explore the range of public services that are already available. Commenting at the launch, Barry Lowry, Government Chief Information Officer (GCIO), said: “The Office of the GCIO, part of the Department of Public Expenditure and Reform has been working in partnership with the Department of Social Protection to implement a Public Services Card that is safe, secure and robust, and that combats fraud and identity theft. Linking the Public Services Card to ‘MyGovID’ means that Government and public bodies can safely offer a range of high value public services online and that ‘MyGovID’ users can access online public services assured that their personal data is secure. A Public Services Card holds a person’s unique identity and provides safe and easy access to public services in Ireland. Almost 2.5 million people in Ireland already use their Public Services Card to safely access a variety of government services, including Travel, Revenue and Social Welfare services and over 10,000 new public services cards are issued every week in Ireland. It is essential that people can keep their identity safe; their transactions with government secure and prevent fraud. For this reason, most government services in Ireland will, over time, require you to have a Public Services Card. You can currently register for Public Services Card from over 100 locations throughout Ireland. A Public Services Card is also fundamental to a verified MyGovID account, as it allows for a safe linking of a person’s identity and their “online identity” for government services in Ireland. MyGovID provides users with a safe secure online identity for Irish government services. A MyGovId account will act as a secure “single sign on” identity for multiple online government services across a variety of government and public sector organisations. Users can already access a range of social welfare services and Revenue’s “MyAccount” service using a MyGovID account. Eventually, all government online services will migrate to the secure MyGovID platform. By 2020, public administrations and institutions of the European Union should be open, efficient and inclusive, providing borderless, personalised, user-friendly, end-friendly, end-to-end digital public services to all citizens and businesses in the EU. Innovative approaches are used to design and deliver better services in line with the needs and demands of citizens and businesses. Public administrations use the opportunities offered by the new digital environment to facilitate their interactions with stakeholders and each facilitate their interactions with stakeholders and each other.